There was a time when the use of the vehicles was limited to transportation purposes only. With the dawn of the 21st century, the significance of the cars has totally changed as cars are not only a means of transportation anymore. Now cars serve many purposes such as status symbols, an embodiment of the technology, Artificial Intelligence enabled machines and much more. Having said that, all the innovative technology that cars showboat these days would not have been possible without a revolution in the engine technology. Engines, well, do they need any introduction? They are the driving force behind all the cars and have come a long way. Since the innovative technology has overtaken the engines, many options have emerged on the table for the customers to choose from. There is no denying the fact that engines can be costly, very costly in some cases. That being the reason, the option of replacement engines has emerged. Replacement engines come in a variety of types each with different price tags but one thing is for sure, they cost much less than the original engines and what else a car enthusiast want. Let us spend a moment talking about replacement engines and their types. 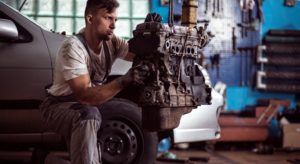 Engine replacement refers to the activity of replacing a faulty but original engine with a reconditioned, used, rebuilt engine or crate engine. Replacement engines also empower the old cars to rediscover themselves in terms of performance and efficiency. There are four most common types of replacement engines. Remanufactured engines are also known as reconstructed engines as they go a lengthy procedure of reconditioning. It involves engine experts and professional mechanics who, using their expertise, reconstruct the worn out parts of the engines. The process spans over a no. of stages. As the starting point, the first stage involves the separation of the engine from the car which necessarily means that the engine is taken out of the car wholly. Then it is fragmented into parts to analyze thoroughly. All the parts are then cleaned systematically in order to get rid of the dirt, used grease and oil etc. The process also comprises of scrubbing the crankshaft, engine block, pistons, and connecting rods. In the second stage, the engine enters the realm of reconditioning. This is a critical stage as different parts of the engine are tested for defects. After conducting these tests, the engine experts fix the damaged parts and replace the faulty parts with fresher ones. With that, the surface of these parts is refined to diminish the force of friction among them. Then starts the third stage which involves the reassembling of the parts of the engine. Highly skilled engine mechanics use cutting-edge technology and automated machinery to amass each part of the engine with extreme caution. They also keep in view the standards and guidelines of OEM in terms of engine tolerance. In the fourth and final stage, the engineers run consistency and strength tests to endorse the performance and efficacy of the reconditioned engine. No engine is shown the green light to the market unless it passes all the tests. Given the circumstances, remanufactured engines come with a heftier price tag than the other replacement engines. Be that as it may, they are backed with a longer span of warranty. The Rebuilt engines, in contrast to the remanufactured engines, are partially taken out of the car and inspected for the faults. Only the worn out parts of the engine are swapped by other used parts on the basis of same specs and features. Nevertheless, certain new components may also be fixed to make the engine work accurately. In this regard, the rebuilt engines are akin to the used engines but the difference is that these are in certain working condition. The worth of a rebuilt engine varies depending on the mechanics. In fact, a skilled mechanic can rebuild an engine in a way much better than a rookie. In spite the fact that rebuilt engines come to the market in fully working conditions, they can still carry the signs of wear and tear such as cracks. Conclusively, rebuilt engines aren’t considered reliable and are likely to face failure all over again. Crate engines are usually available to the traders only owing to the fact that they are brand new and unused engines with zero mileage. That is the reason why crate engines are quite expensive. To give you a rough idea, a crate engine can sometimes cost more than the vehicle itself. Fundamentally, a crate or new engine is exactly the same that a brand new car is equipped with. They have all the components new whether inner or outer. Why they are called ‘Crate’ is because of the fact that these are transported to the trader or dealer on a Crate. Several automobile companies manufacture crate engines with almost similar features. To pay the charges for the Crate engines can be backbreaking as they range from a staggering £5000 to £12000, depending on the make and model. As the term depicts, a used engine is the engine that was being used in some car and taken out of it to be equipped under the bonnet of another similar model again. Used engines are normally taken out from useless or damaged vehicles or insurance write-offs. The mileage of these engines varies depending on the car from which they were extracted. Second-hand or used engines sometimes come with supplementary components like manifolds and injectors. Nonetheless, the auto experts suggest that only genuine components should be used since there is no guarantee that these components are in proper working condition. Also, no standard warranty shelters these engine components. Since the source of the used engines is usually those cars which have been through some accident or major fault, one should not get one’s expectations very high for them.